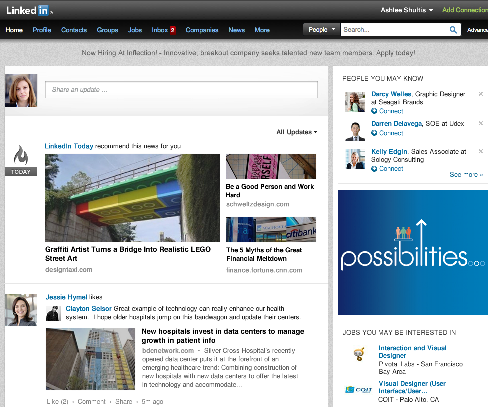 Recently the LinkedIn Homepage had a significant makeover. It’s now more sleek and modern. It also feels faster with an almost instantly updated user interface. LinkedIn has made a few key design changes to make it easier to discover and discuss what matters most. 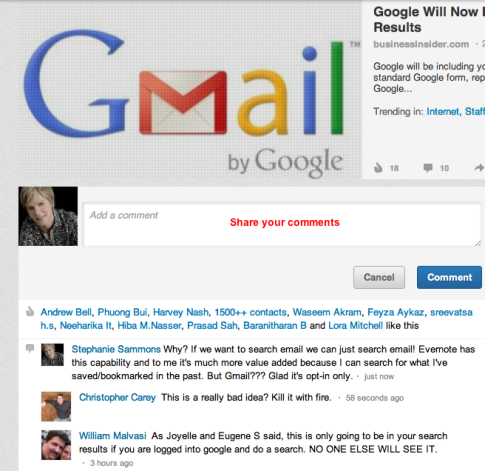 Mashable refers to the new LinkedIn Homepage as a mash-up between Facebook and Google+. I’d have to agree. There is something more appealing about it that makes you want to hang out for a while! On your new homepage, you will first notice a blue box to click that will show you the most recent updates from your network. The top part of the new LinkedIn Homepage. From there, underneath your status update box, you will see “LinkedIn Today recommends this news for you,” along with three recommended stories. The news stories in this area are consistent with the industry you work in or publications that you have indicated an interest in following on LinkedIn Today. If you click through one of these news stories, you’ll be taken to the LinkedIn Today aggregate news page, where you can view and comment on additional relevant news stories (more on the changes to LinkedIn Today shortly). LinkedIn Today delivers the day's top headlines that matter to people in your industry. Follow the industry and sources you care about. The updates you see are based on who and what LinkedIn believes to be the most relevant for you. Don’t forget to engage with your connections directly from your homepage! You can typically like, comment, send a message or share to effectively engage. This will also help you to be viewed as someone who is “plugged in” and listening to your connections. Engage with your network via your LinkedIn homepage. LinkedIn allows you to filter your update stream and customize your view. For example, I like to filter my stream by “Shares” to see what content my network connections are sharing. This filter takes away some of the clutter. Filter your homepage updates with these options. Overall, the Updates section of the new homepage is simply more social. The stream of activity is cleaner and easier to follow. Images are also more prominent within the updates from your network. When posting your own updates, use an image if possible to capture attention! Images are now bigger within LinkedIn status updates. Remember that anytime LinkedIn members visit the site, they typically start from the homepage. Being active on LinkedIn can help you show up on the homepages of your connections. Showing up consistently can lead to more profile views, and ultimately LinkedIn profile views can turn into website or blog traffic. Strive to update your status or participate in some sort of LinkedIn activity 3-5 times per day, throughout the day. This includes regular status updates from your own homepage, participating in group discussions, leaving comments, making new connections, answering questions, etc. In order to gain traction with marketing your brand and building influence on LinkedIn, you need to be consistently visible and valuable. If you have a company page on LinkedIn, make sure to update your status there as well. Typically 1-2 company updates per day are sufficient. If you want to stand out among your connections, make your updates engaging. Ask a question, ask for feedback or even consider running a poll. Also, comments are a great way to spark dialogue with your connections. I mentioned previously in the article that LinkedIn has made the sizes of images included with status updates larger and more prominent. Therefore it makes sense to use images in your status updates whenever possible in order to attract attention from your network. In the screenshot below, which status update stands out the most? Use images whenever possible to make your LinkedIn status updates stand out. 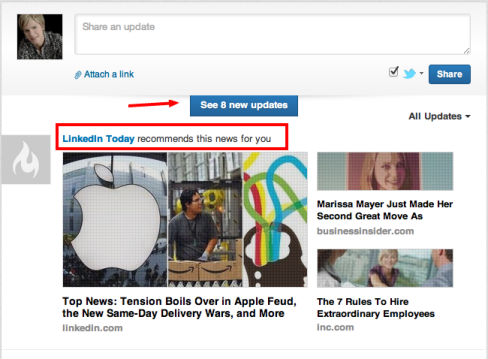 LinkedIn Today has also been given a couple of awesome new features recently to make the news site more social! First, you can now click on “Trending in Your Network” on LinkedIn today to view specific news stories that have been shared by your connections. Click on "Trending in Your Network" to view articles shared by your connections. 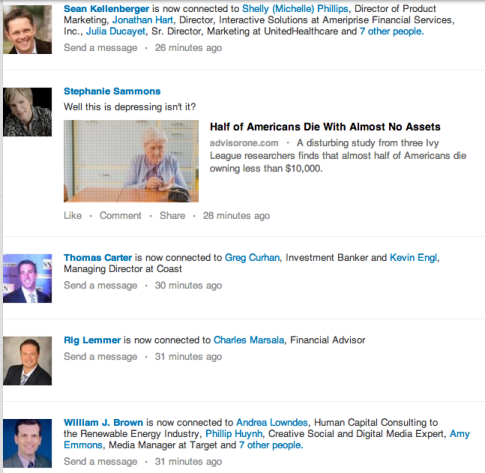 Second, you can like, comment, share and save news stories on LinkedIn Today. The comments don’t appear to be threaded conversations; however, your commentary on a trending news story will appear on the homepages of all of your connections! If you comment on a few news stories each day through LinkedIn Today, you will keep your status active, create potential engagement with your network and also receive the benefit of having an image inserted into your status update! Share your unique commentary on trending news topics on LinkedIn Today. LinkedIn is getting more social. Be sure to tweak your LinkedIn marketing to leverage these new social features. And if you haven’t already got a LinkedIn marketing plan in place, it might be time to consider implementing one. The ongoing improvements to LinkedIn continue to make it a compelling network for business professionals, business owners and anyone looking to improve their career or job opportunities. What do you think? Have you seen the new LinkedIn homepage? Do you like or dislike it? Will you implement some of these ideas to grow your visibility? Are there any features I’ve missed? Please share your comments below.